Have You Ever Put a Lock on Your Fridge to Keep Kids Out? Have you ever come across a question that made you think “wow, you know what, now I wonder if I should do that too?” A fellow mom mention on a parenting group said she was at her wits end with having to constantly steer her kids away from the fridge and was wondering if any other moms put a lock on their fridges or just suffered through it. So of course, we were spurred into action, looking into the pros and cons to help YOU decide whether you should put a lock on YOUR fridge! See what you think, then let us know what you decide! As a parent, you anticipate watching your kids grow and develop. You can’t wait for your kids to start talking, crawling, and walking. Once you get your wish, however, you have to work hard to keep your kids from getting into mischief, especially in the kitchen. You start wondering whether you should put a lock on the fridge to keep those kiddos out! Related: Baby-Proof Cabinets Easily Without Tools with Rimiclip! 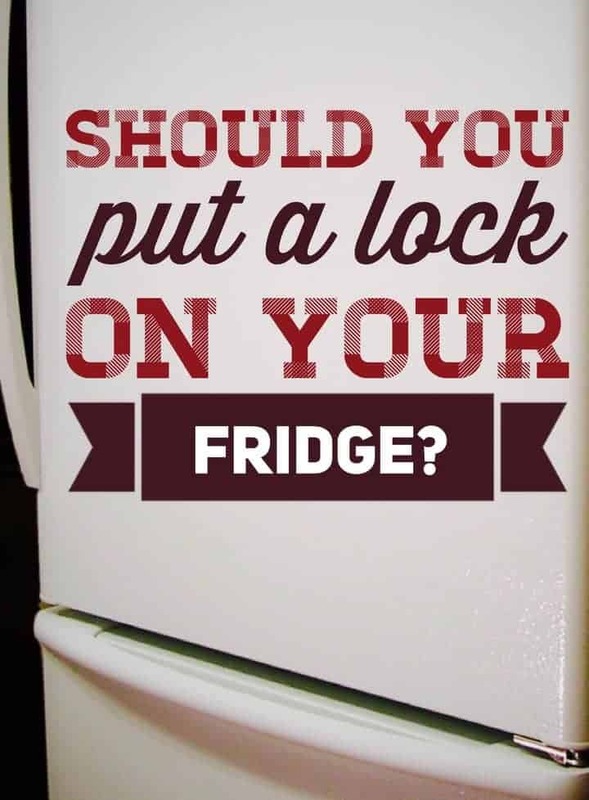 Should You Put a Lock on Your Fridge? Locking your fridge with a lock can have many positives, making it the right choice for you and your family. Putting a lock on your fridge will keep your kids out of it, helping you to better manage the food inside of the fridge. If your child is able to access the fridge, you might find them grabbing snacks randomly, especially the sweet treats. Another reason why you might want to put a lock on your fridge is so that you can keep all of the food in your fridge from going bad. If your child opens the fridge and leaves it open even a crack, your refrigerator will be unable to keep your food cool. This can ruin your perishables, which costs you time and money to replace. Alternatively, locking your fridge with a lock could be the wrong choice for you and your family due to the negatives associated with it. One downside to putting a lock on your refrigerator is the inconvenience it is to take the lock off. Do you really want to fumble with a lock every time you want to grab something simple out of the fridge? Keep this in mind when deciding whether or not to lock up your fridge. Another negative you need to be on the lookout for is losing the key to the lock or forgetting the combination code. If this happens, it could take some serious time before you can access your fridge again, making locking your fridge a troublesome thing to do. Putting a lock on your fridge is a decision you need to make after weighing the pros and cons. There really isn’t a right or wrong answer. Every family does what is best for them. What did you decide? Will you put a lock on your fridge or just hang in there until your kids are old enough to understand that they can’t go into it without your permission? I too have problem of a $1300 a month food bill as a single father of 2. 3 in household. I have been told by a friend of mine that had this same issue in East Tennessee MTN area. That it is a dcs violation to withhold food from your children. In turn I fix it by only buying enough food for 3 people in 2 day increments. I am obviously not the norm here, but I am looking into ways to control the food, as my autistic son gets into everything and it is subject to being gone. He is a teen so not as easy as a toddler to control anymore. I am not happy about needing to hide food, but it is out of hand. I don’t think locking the fridge is a solution for our family (we rent and the fridge is not owned by me so can’t start manipulating it), but I will likely buy a mini fridge to keep some items that are important for meals in there, and lock that instead. My daughters dad and step mom do this. Down side, they go to work and the kids are at home all day from 7am to 6pm without food. Also, my daughter works summers there, and she ate once at 12 pm bc their work schedule didn’t coincide with hers, so she couldn’t pack supper, and they didn’t bring anything for her to eat. All day life guard training with no food/. We have a child with autism and another who eats all day, but somehow we manage without locks. Watch your kids, put them on a routine, etc. you’re locking food away from your child. If they’re overweight, guess who is to blame??? You, the parent. Don’t buy junk. Cook healthy and have healthy snacks available. Go out and play with them!! So tired of all these excuses!! My little sisters have cried and I just hate living like this…its so embarrassing too. I dont want to have friends over because I dont want to have to explain why they cant have a glass of milk when they want it. I feel like a animal…When I move out, I am taking the fridge key, there bedroom key, All the keys to everything that they locked up and throwing them out the window on the highway while I leave this horrable house! Iwe had my boyfriends daughter move in with us 2 years ago. She was 15 at the time, prediabetic (with diabeties running through both family bloodlines) high triglycerides, and high cholesterol. Also she is in the Obese range for BMI. We have tried so hard to krep food that is healthy and accessible, teach her healthy portion sizes, ect. I might add I buy almost all the food in the home. If I got a bag of fruit for the family she would eat all of it in one day (not an exageration) same with any snacks, and food. I have made it very clear she is to ask before touching any food bc it may be an ingredient for a recipe or not intended as a meal, however after 2 years shes still doing it. I think she might have a binge eating disorder, as she eats large amounts of food in secret, spends her allowance on food I dont buy bc its not good for her body, dad does not have clear boundries, nor consequences for her behavior, when there is a consequence he does not follow through with it. I feel her unhealthy relationship with food maycorrelate with lack if consistant restrictions, boundries, and consequences from dad. Maybe a cry for help? She also has social, emotional and mild cognitive delays so technically she may be 17 but she is really maybe 12 or 13 in her developement, however has the responsibilities and and uninhibited freedom of a 17 year old teen. In light of this situation I feel to both protect my wallet and her body that a fridge lock is necessary as well as locking cupboards, at this time as inconvenient as it will be. At least until Dad can address the issues she is having in relation to food and she gets the help she truly needs. I am having almost exactly the same issues as you are. In doing the math we are spending almost twice the amount allotted in our budget for food. We have specifically told the children that certain food is specifically for their school lunches yet within a matter of days all the food we buy is gone. while we are happy to make them something and or they can make a sandwich, wait for dinner, or have something small, they are giving no regard to the rules we are setting forth and are sneaking food all throughout the day and night. Upon doing laundry or straighten up are we find our empty wrappers and containers along with dishes bowls cups etc in their rooms. I am at my Wit’s end and just do not know how this is going to turn out aside from putting a lock on the pantry closet. I’m not one to ever deny a child something to eat when they are hungry I have no problem with that however when the things we buy for them are gone within 1 or 2 days then obviously there’s an issue. I would love to hear more about how your situation has turned out. Please keep me posted! Wow I can’t imagine putting a lock on my fridge. My kids are only 3 & 5 but I still don’t think this will be necessary when they get older. No! My kids can eat whatever they want to eat especially they are hungry. They can eat fruits or make themselves sandwiches. Never really saw this as an issue. I am not sure that I would feel comfortable doing that. A lock? What about kids asking permission? Or, why isn’t it ok for them to go in the refrigerator? I am old and times have changed. I did find the post interesting as I like hearing about things from another’s perspective. I didn’t know this was an issue. I think teaching your child control and manners might help here. My kids are 10, 4, and 2 and before anyone heads to the fridge they ask, and furthermore, we eat and have snacks through out the day. The kids know not to ask for extras, because at such and such time they will have snacks or lunch or dinner. I’ve never even considered this. Odd. Thanks for the list thought! Never would put a lock on the fridge. They know to ask before going into the fridge. Never had any issues. I never had that problem with my kids. There was an understanding that if there were sweet treats they had to be divided evenly and it worked for us. We’ve not had a problem like that. Our kids ask if they want something and we have lots of snack times. We also have a gate in the door way so the smallest won’t crawl in when we are not in there. I had no clue that this was an issue in some households. Putting a lock on the fridge would be such an inconvenience for me. I have never put a lock in our fridge before. The kids can eat anyway they want to eat. There is always fruits that they can eat healthy. I might need a lock not for my kids but for a neighbor that always ask for food lol. Never would have even considered doing this. I’m glad we never had this issue at home. The kids always ask when they need something. I would never, but like you said- it;s an individual decision. We are strict with our blueeyedbabies to ask before they get into the fridge, mostly because we worry that they won’t close it all the way. But thank you for the pro’s and con’s! I can think of some families that might need to consider doing this or something like it. My kids just always asked first, so I never even realized this was an issue for people. I can’t imagine putting a lock on it! well, we never had this issue at our home. We made sure the children’s needs were met and taught them about asking. So we did not have to consider the lock. Thanks follow r the pros and cons, though. I see nothing wrong with locking a fridge or pantry, as long as the children are provided meals and snacks at regular intervals. Parents should be sure that the children have access to snacks/ light meals if they won’t be home until late. For compulsive food behaviors, locking the food is the responsible thing to do, it’s a safety issue. However, if the child is compulsive, professional help should be consulted as well. Do what works for your family & everyone else….try to judge a little less. St. Patrick’s Day Cupcakes with a Secret Healthier Twist!